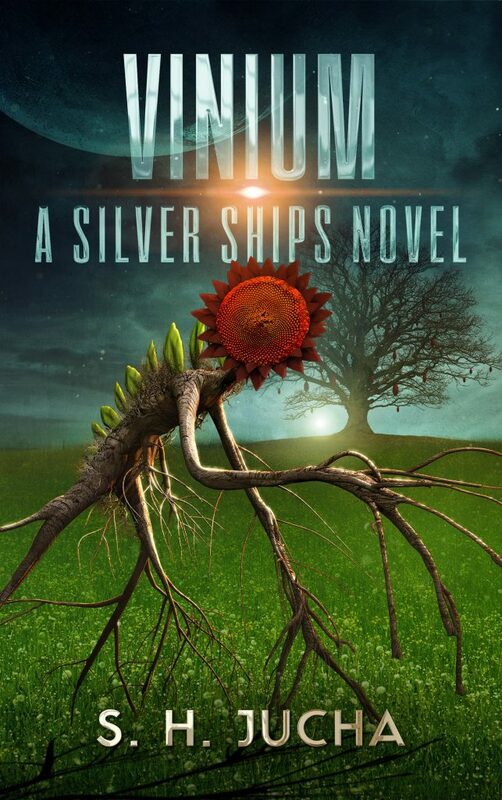 “Vinium, A Silver Ships Novel,” is available for pre-order on Amazon at this URL: https://www.amazon.com/dp/B0778HQ53L. The Kindle version of the novel will be released on Nov. 13th. The softcover paperback version will also be available by the release date. An audio book version of the novel, narrated by Grover Gardner, will be released in early 2018. This entry was posted in Readers, Uncategorized on November 8, 2017 by Scott Jucha. Thank You Sir for TSS Series. I am in love with them. You’re welcome, Aria. I’ve enjoyed writing both the Silver Ships and Pyrean series! I’m thrilled this book came out earlier than expected. I loved the Pyrean series but Alex was my first love. I’m pleased you’re enjoying my stories, Philda! The two series, Silver Ships and Pyreans, will develop in tandem for a long while. They’re equally intriguing to me. Does UE/Sol raise the question of the safety of the other 3 colonies due to the probes? Does UE/Sol’s navy ask to join the fight against the Nua’ll? I’d like to respond to your questions, but I don’t want to spoil the story. I know from our previous discussions that you enjoy the audio book version of the Silver Ships series, and I expect “Vinium” to be released in audio book form in early February. Did you already read the e-book? I got as far as the discovery of the probes when I posted. I have no problem if it is being answered or not, it just means it is being answered in one form or another in the next book or in a future book. You’ll receive your answers within “Vinium.” Most of them will common through the efforts of Olawale Wombo. Olawale and his fellow Earthers fear for their home world and wish to ensure that Sol is not in jeopardy. I finished it the other day. Looks like the UE/Sol is getting the first upgrade like how New Terra recieved. Looks like I will not find out the full extent until the next book. You have a good imagination, K., although it’s not headed in the same direction as mine. I’ve another use for the Pyrean dome! Cheers! It was worth a try to guess what that dome does. Even if it was wrong. There’s never any harm in trying. Besides, you can never tell what ideas I might use later, when readers discuss their thoughts with me. If one of the 2 aliens found on the 3rd moon is suppose to be native to the system, wouldn’t there also be facilities on the planet Pyre as well with an active power supply or reactor similar to the moon? Why wouldn’t any of the Nua’ll spheres on the human side of the wall just attempt to comm fry any warship or automated carrier while using their compliment of slaves to fight back? Your first question is about “Empaths.” Remember that the Pyreans were trapped for two days and were anxious to be released. They didn’t stop to investigate. “Messinants,” the second book in the Pyrean series, will provide the answer to your question. Your second question is about the Silver Ships series. You’re assuming the large spheres that inhabit the human side of the wall are capable of doing that. The small sphere that Alex encountered at the wall is a unique ship, built for the purpose of communicating with other species. Would the metal eating nanites missiles be capable of dissolving the sphere and bullet ships? If two or more spheres are in a system, something like this would likely be needed to reduce the numbers of threats quickly. Spheres do have a vulnerability period when they open up to launch the bullet ships. Recall two distinct points about the nanites used at SOL, as a demonstration. The nanites were created specifically for the United Earth ships. Alex and company have already encountered two different alien spheres. Could that mean the metals aren’t the same, which engenders a risk to depend on them. Second. Alex was terribly hurt when the attempt to prove to the Earthers that he had such a weapon went awry and cost the lives of the destroyer crew. Alex is less likely to use a weapon that he can’t tightly control. An enjoyable read, was looking forward to a more indepth look at the Tree people but it wasn’t to be. Maybe in the next book. Earth and the Sol system looks like the next bit of a build up to the next book so I think once Alex gets his allies sorted out he can then focus on finding out if the Nu’al are the super race or just another race forced into servitude like the Sweswe, just a little higher on the totem pole. Hello Arthur, I’m please you enjoyed “Vinium.” I felt the passive natures of the Ollassa ensured that they wouldn’t be joining Alex’s expedition. Your expectations are quite accurate, but you have the order backward. You’ll find your answers in “Nua’ll,” book #11 in the Silver Ship series, which I hope to release in March. Thanks for reading, Arthur! I love the series and I cant wait for the next book to come out. Any idea on a time frame? Hello Ben, thanks for you generous comment. Two books are in the works: “Messinants,” the second book in the Pyrean series, will be released in March, and “Nua’ll,” the eleventh book in the Silver Ships series, should be available about June. I wish the books would get back to more action and less banking and politics. It seems like the books have been changing as the series progresses. Hello Jim, a central theme of the Silver Ships series has been humankind’s efforts to protect their home worlds from invaders and usurpation. That said, in the last story, thousands of innocent aliens lost their lives defending their planet, humans’ ships and crew were lost, and enemy ships destroyed. That strikes me as more than a sufficient amount of carnage. Furthermore, the end of the same book heralds a significant encounter to come. Just finished listening to all of the audiobooks in your Silver Ships series…I can’t tell you how glad I am you decided to become an author! You have devised a wonderful epic story line that delivers each and every book. kudos! I foresee this epic coming to the silver screens oneday and will ultimately rival the Star Wars/Star Trek franchises. Thank for your generous comments about the Silver Ships series, David. And, yes, “Nua’ll,” the eleventh book in the series, will be released this summer, 2018.